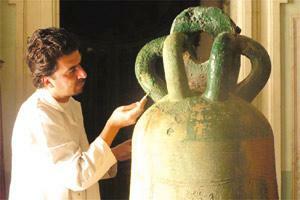 Campanologist Kenneth Cauchi restoring the mediaeval bell, Petronilla. A mediaeval bell by the name of Petronilla, which until recently was still suspended and rung daily from the northwest belfry of Mdina Cathedral, is to be exhibited permanently in the Mdina Cathedral Museum after it was restored by campanologist Kenneth Cauchi. Cast in 1370 by the Venetian brothers and bell founders Nicholas and Victor, the bell is the only local mediaeval campanological specimen still in situ and is the oldest bell on the island. It was taken down from the belfrey because internationally it is an extremely rare example of mediaeval campanological art. Also, continued use of the bell would have risked cracking it, rendering it toneless. The bell's musical timbre gives an idea of what bells sounded like in mediaeval times. Weighing over a tonne, it was cast for the original Gothic cathedral destroyed in the earthquake of 1693. It is in fact one of the few mementos surviving from the original episcopal edifice. It had been lowered from the cathedral belfry in 1645, christened Petronilla and consecrated in honour of St Peter on August 7 by Bishop Miguel Juan Balaguer Camarasa (1635 - 1663). The latest lowering was a very delicate and complicated operation. Its vacated arch in the belfry has now been occupied by the Cathedral's treble bell, Publia, cast in 1958 by the famous bell foundry of Prospero Barigozzi of Milan who also cast the bass bell of the cathedral in the same year. Petronilla was placed in the cathedral vestry and treated there by Mr Cauchi in a job which involved the removal of three paint coatings which had been applied in error to the crown of the bell some years back. Other conservation treatment work consisted of the removal of various corrosion products and rust stains. Corrosion inhibitors and protective coatings have been applied to the surface bell after cleaning.